It’s not a surprise that our society is getting faster, smarter and more streamline. Our entire lives are practically impacted by the use of mobile applications in this ever-changing world. Can you even remember a time when you weren’t opening up Google on your phone to look up stats on your favorite athlete, double-checking the time your Wednesday night lineup started or searching for lyrics to your favorite song? Similarly, real estate mobile apps have changed the face of the housing industry for brokers and agents. There was a time when current housing information was buried under heaps of old dusty files, never to see the light of day. Thankfully, technology has evolved to a point where information that would have had us waiting in line at a government building or sitting on hold listening to an instrumental version of “Forever Young” by Alphaville, is readily available with just the swipe of a finger. Because real estate mobile apps allow buyers easier access to information they otherwise wouldn’t be privy to 15 years ago, agents and brokers have to be able to dull out stats that can’t be easily found on the one sheet or online. Buyers want to be impressed with housing professionals’ level of knowledge, and with mobile technology becoming more perceptive, agents and brokers have to become proverbial housing concierges. Real estate mobile apps have changed the level of dependence consumers feel for real estate professionals in needing access to housing information. This might sound like a negative aspect of emerging technology, but in actuality, apps allow the consumer to use tools such as mortgage calculators and property estimates that can help them better understand the likelihood of homeownership. While consumers’ ability to educate themselves is a positive, there’s still an important role for brokers and agents, especially when it comes to financing. While access to real estate information is definitely a perk of new technology, it seems that statistics are showing buyers are still relying heavily on actual real estate brokers and agents to handle their transactions. 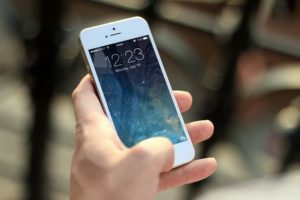 According to NAR stats, “87 percent of buyers purchased their home through a real estate agent or broker, a share that has steadily increased from 69 percent in 2001.” With many mobile apps, a listing of licensed brokers and agents—who can ensure a buyer gets the earned equity from their home—is easily accessible, making FSBO dealings obsolete. Anyone who’s ever purchased a home before—or sought advice from an experienced homebuyer—will tell you that once the excitement of an accepted offer has worn off, the anxiety sets in, having to think about the paperwork that’s soon to follow. With mobile technology, brokers and agents can scan and send contracts with the click of a button, and consumers can sign and immediately return important documents for the underwriter’s review. For real estate brokers and agents, mobile apps are becoming the easiest ways to conduct business.